In the surreal landscape of Robot Reflections we find a nomad walking along the shore followed by a utility robot. They are dwarfed by their mirror image in the water. In this fantasy of artist Jan Urschel the earth is a post-apocalyptic desert littered with the carcasses of giant tankers that once roamed the oceans. Little is left of the former seas on earth. Refineries are trying to extract whatever water remains from deep below the earth. Here and there small ponds of water are left reflecting the sky and clouds above. The beautiful reflections a reminder of views that humans took for granted centuries ago. Finding beauty and lyrical aspects in mechanical and industrial landscapes of possible futures have long been an obsession of artist Jan Urschel. 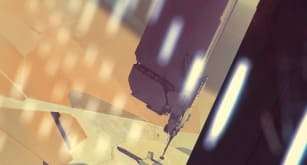 Jan Urschel ist ein deutscher Konzeptdesigner und Illustrator, der in Singapur lebt und arbeitet. Mit prominenten Kunden wie Paramount Pictures, Warner Bros, Lucasfilm, Marvel, EA, Sony, Ubisoft, LucasArts, Cloud Imperium Games, Psyop und vielen anderen gehört Urschel eindeutig zur Spitze seines Fachs und entwirft Konzepte für die unterschiedlichsten Bereiche, von Spielen wie Call of Duty und Assassin's Creed bis hin zu Filmen wie Ghost in the Shell. 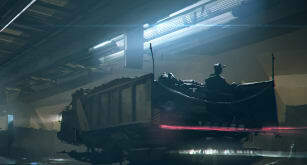 Copyright: Jan Urschel - Cook & Becker B.V.